Preheat the oven to 150°C (130°C fan), Gas Mark 2. Stand the brisket in a roasting tin and apply the rub all over the beef. Pour 100ml cold water into the base of the tin and cover tightly with foil. Cook low and slow, basting occasionally, for about 5 hours until tender. When tender, cover with foil and allow to rest for 30 minutes. In the meanwhile make the remoulade. Coarsely grate the celeriac or use a food processor to make thick a shred. Place in a bowl and add the lemon juice. Stir in all the remaining ingredients and leave to stand for at least 30 minutes. 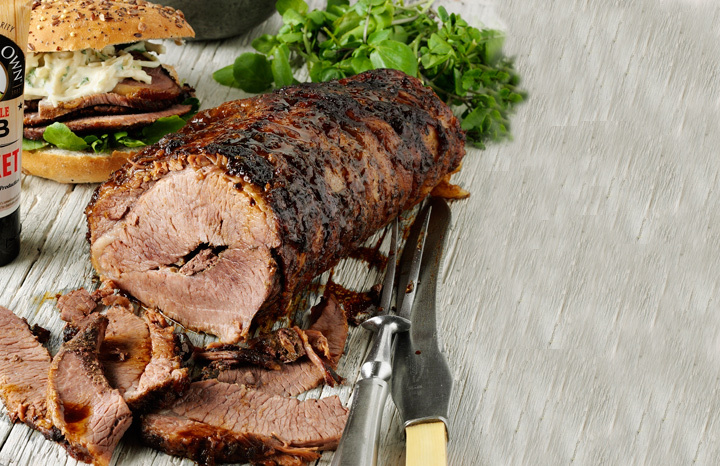 Slice the beef into thin slices and serve in rolls with watercress and a generous helping of the remoulade. Recipe from Newman’s Own American rubs and sauces for National BBQ Week, 25th– 31st May.